It’s been a long time coming – over 3 years – but I’ve finally got around to releasing a new version of DrumBurp. Version 1.0 is now available for download. This is the first time there’s been a major version change, and it’s because it’s the first time there has been such a large amount of extra functionality in one release. Various life events have conspired to stop me releasing a newer version of DrumBurp over the last 3 years – I live in a different country now, for example – but I’ve kept tinkering with it on and off, adding new features and fixing bugs. There’s been a pretty major overhaul of some of DrumBurp’s insides: things which won’t be that visible to the user, but should result in more stability, a much better overall user experience and better maintainability for me as a developer. Of course, there are also a lot of pretty big changes that you can see too! DrumBurp can now call Lilypond for you and display the results in a tab in the main window, so you don’t have to keep switching backwards and forwards as you make changes to see what they’ll look like: There’s also a tab for the ASCII export so you can see what that would look like too. The most commonly asked for feature from user emails: it’s now possible to change the tempo of a score at any measure, rather than having a single setting for the entire score: This will be set correctly in the Lilypond output, and the MIDI playback/export supports it correctly as well. Another frequently requested feature: you can set sticking indicators above and below the music. Scores are now saved in a much more efficient compressed format, taking up about 10% of the size of the old files. DrumBurp should always be backwards compatible with scores produced by older versions though: you’ll still be able to load your old scores. DB will ask if you want it to create a backup of your old scores before overwriting them with the new format, just in case something goes wrong. It’s possible to set what colours you want the interface to be displayed in: not everyone will want to use my combination of colours for the interface, and now you can pick whatever seems best to you. Measures, or groups of measures, can be set as “simile repeats”, i.e. markings saying “just play the previous measure again” (or 2 measures, or 3 measures, or…). Again, Lilypond export and MIDI playback respect these markings correctly. You can pick common measure counts from a context menu by clicking on the time count underneath a measure: it’s a lot a quicker than having to go through the dialog box. Lots of little tweaks to the display which should make it a bit easier to use: the note you’re about to place is displayed in a different colour before you click it, for example, and a box is drawn around the current time position so it’s easier to see if you are placing a note at the right time. When playing back the score with MIDI, the next measure to be played is highlighted as well as the currently playing one. Also, the window will try to smoothly scroll so that both of these measures are easily visible. This correctly follows all repeats and alternate ending marks. DrumBurp can optionally display the measure number above the first measure of each staff. 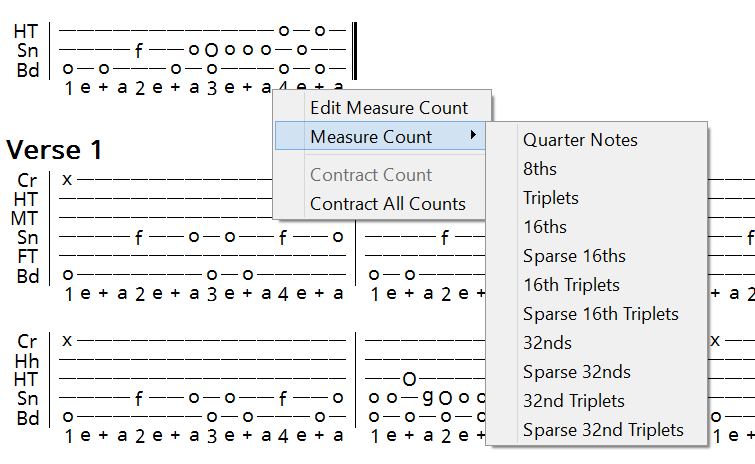 You can ask DrumBurp to “contract” the count for a measure, or all the measures in the whole score. DB will then pick the coarsest time division for each measure which will still display all the notes, potentially saving you lots of space in the display. Proper unicode support for all free text elements, so that any characters can be used for, e.g. song titles or artist names. Bug fixes to the user interface: sometimes the UI would get “stuck”, and you’d have to close DB and re-open it to get it working again. Now, even if something goes wrong and DB gets confused, pressing the Escape key should always get you back to a usable interface. 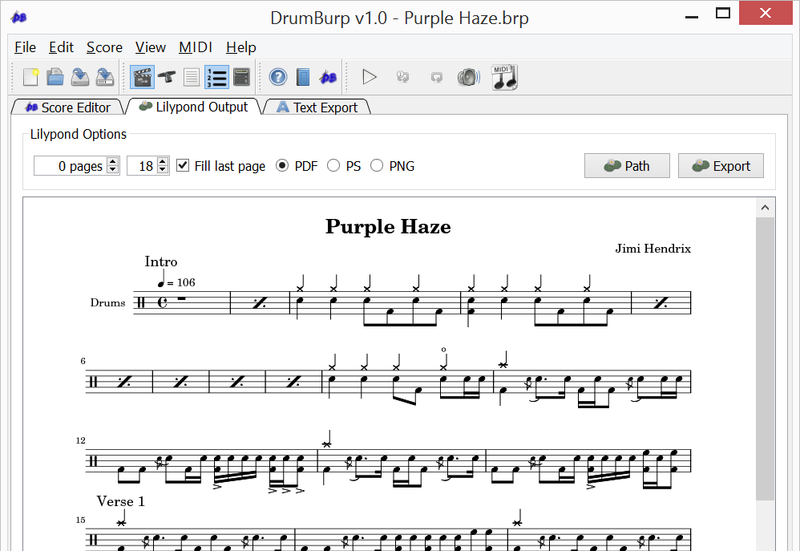 There are 2 big features which have been requested a number of times by users, which DrumBurp does not yet have: the ability to place arbitrary text between staffs/sections, and some way of importing drum tabs into DrumBurp. I really want to add these features, but they will take a significant amount of work to add: I’ve played around with some ideas for how to do them, but it quickly becomes clear that there’s a lot to do to get them working. Rather than delay this release any further, I’ve decided to get it out there and work on those features as the next steps for DrumBurp. So, give it a try. Please let me know if you encounter any problems using this latest version, and I’ll do my best to get bugs fixed as soon as possible. Previous Previous post: Startup problems?